The Battle of Gaugamela was a prime example of how the terrain was important in battle. This battle took place in 331 BC between Alexander the Great, from Macedon, and Darius III, leader of the Persians. Alexander led his army to victory. The battle was fought in the plains of Macedonia in Gaugamela, which is a small village near modern-day Iraq because Darius wanted to stop Alexander from encroaching even more on the Persian empire (Britannica). Darius specifically picked out this place to have the battle. It was an “empty plain suitable for cavalry; not even shrubs and short bushes hide the ground, and an unobstructed view is allowed even to objects which are far away” (Curtius 247). Also, “if there was any eminence in the plains, [Darius] gave orders that it should be levelled and the whole rising made flat” (Curtius 247). Darius wanted to ensure a level playing field for the battle (no pun intended). Alexander had a strong cavalry called the Campanian, or Companion, Cavalry. Since they were heavy cavalry, they wore armor, usually consisting of a metal helmet and breastplate (Worley 156). Their weapon was called a sarissa, “a light, cornel-wood spear” which was about nine feet long. The length, weight, and shape provided easy throwing, smooth riding, and multiple attacking maneuvers (Worley 156). Darius decided to make his cavalry his strong point, especially since Alexander led such a fine cavalry. It was also advantageous that the land was flat and convenient for cavalry. Darius’ formation included a very strong left wing, with approximately twenty thousand cavalry, which would compete with Alexander’s seven thousand (Sidnell 108-109). Alexander was able to view Darius’ formation from some hills. He noted that “even if he massed all his cavalry on that wing they would be outnumbered three to one, and of course his other flank would be left unprotected” (Sidnell 109). 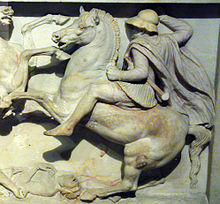 Darius flees during the Battle of Gaugamela (Anonymous). Anonymous. The Battle of Gaugamela. National Archeological Museum of Spain. “Battle of Gaugamela.” Britannica, Encyclopaedia. Encyclopaedia Britannica Online. n.d. 28 February 2014. Curtius, Quintus. History of Alexander: Books I-V. Trans. John C. Rolfe. Cambridge: Harvard University Press, 1946. Sidnell, Philip. Warhorse. New York: Hambledon Continuum, 2006. Worley, Leslie J. Hippeis: The Cavalry of Ancient Greece. Boulder: Westview Press, 1994. Alexander the Great was the ruler of Macedonia in the year 336, following the assassination of his father, King Philip II. Before then, he was put in command over the left wing of the Macedonian army at the battle of Chaeronea two years before his father died. He was a great military leader, and his father saw him a trustworthy heir to the throne because of his loyalty and skill (Oxford). When Alexander did finally become ruler of Macedonia, he began to conquer the East, and continued to do so until his death. His empire stretched over 3,000 miles from the Adriatic Sea to the Indus River (Sacks).To conquer the other lands, Alexander led major campaigns across the continent. These campaigns were very successful. In this post, I would like to focus on one such battle, called the Battle of Granicus River. Alexander the Great began to conquer the Persian Empire, and his first battle against the, was at the River Granicus. In summary, Alexander was up against a slightly smaller Persian army commanded by local Persian govenors. The majority of the battle was fought on horse with cavalry and on foot with soldiers, and took course over a few attempts by Alexander to cross the river, which led to his eventual victory. To delve further into this battle, I will first discuss the terrain of the river and its surrounding areas and how the two armies were set up. First of all, the Persian armies were already posted on one side of the river, having their cavalry take the front line and line up along the whole side of the river. Being on higher elevation, the Persians had an advantage over anyone who would try to cross the river due to a high bank. The Persians were in number some 20,000 cavalrymen, along with a force of foreign mercenary infantry (Hammond). Alexander’s forces were more numerous in size than the Persian army, but were at a disadvantage due to the river and elevation difference. Alexander was in command of the cavalry in the right wing of the army, Parmenion was in charge of the cavalry in the left wing, and the phalanx was in the center in the center, which consisted of two rows. Alexander was urged by some of his close advisors not to charge across the river when they arrived, and was encouraged to wait at the foot of it until the next day and charge the enemy before they could get into formation. Alexander disregarded the instruction and said that is would be unworthy of the Macedonians if they did not do battle that day(Romm and Strassler). Alexander led the first charge against the Persians with his unit of cavalry. They attempted to cross the river, but were unsuccessful. The other wing of the Macedonian army also began to cross the river, but also met resistance. Meanwhile, the main units of the Macedonian phalanx began to successfully cross the river with ease, and eventually gained the upper hand. The Persians began to retreat, but no severe chase was given. Instead, Alexander turned his attention towards the foreign mercenaries that were still in formation. 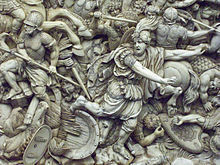 He ordered the phalanx to attack the front while he circled around back with his cavalry. They killed most of the mercenaries, but took around 2,000 alive as prisoners (Romm and Strassler). And thus the Battle of the Granicus River was won. Although Alexander faced a disadvantage due to the landscape, he still was able to gain the upper hand and win a very decisive first victory against the Persian Empire. Hammond, N. G. L. “The Battle of the Granicus River.” Society for the Promotion of Hellenic Studies 100.Centennary Issue (1980): 73-88. Document. Le Brun, Charles. Battle of the Granicus. Paris. Oil on canvas. Oxford. The Oxford Encyclopedia of Ancient Greece and Rome. Ed. Micheal Gagarin. Vol. I. Oxford: Oxford University Press, 2010. Print. Romm, James and Robert B. Strassler. The Landmark Arrian: The Campaigns of Alexander. New York: Pantheon Books, 2010. Print. Sacks, David. Encyclopedia of the Ancient Greek World: Revised Edition. New York: Facts On File, 2005. Print. (source: Wikimedia common) Andre Castaigne’s depiction of Alexander the Great’s siege of Tyre in 332 BC. Siege engines have been used since antiquity to break down walls and gain access to walled or fortified cities. Both Alexander the Great and his father, Philip II, used siege warfare as part of their military strategies. In particular, Alexander the Great laid siege to the ancient island city of Tyre, Phoenicia, present day Lebanon, in 332 BC. After Alexander’s success at the battle of Issus, he wanted to sacrifice to Heracles at Tyre. Seeing this as a ploy to occupy the city, take the last Persian harbor, and increase his navy, the Tyrians refused Alexander’s request, suggesting that he could still sacrifice to Heracles at old Tyre on the main land, but not at new Tyre. Still intent on visiting and worshiping at the new temple of Melqart, a Phoenician God that would have been roughly equivalent to Heracles, Alexander sent representatives to try to negotiate with Tyre. However, the representatives were killed and their bodies were thrown over the walls of the city into the Mediterranean Sea. Alexander saw this as an act of defiance and declared war upon Tyre. Women and children were evacuated from Tyre to Carthage. As well as providing refuge to the Tyrians, they also promised aid in the form of ships to the Tyrians. Tyre presented more than one tactical problem to Alexander due to the terrain; new Tyre was built on an island about a half mile out from shore. Alexander did not have much of a navy at the time, nor did he have much of a way to be able to access the walled, island city. 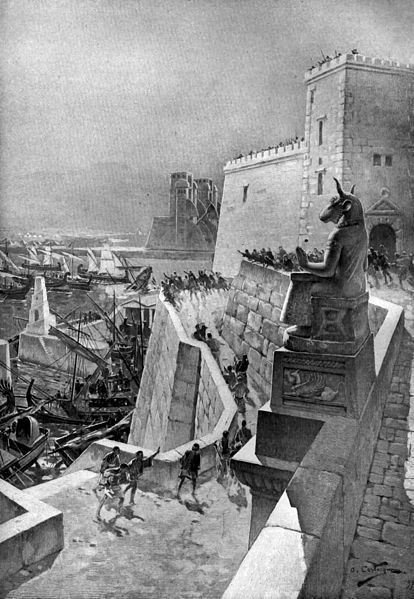 To address this, Alexander began the process of building a causeway out to Tyre so he could transport siege engines and begin breaking down the walls of the city. Building the causeway was not terribly difficult for a while, the sea was shallow and Alexander’s men were able to fend off artillery attacks from Tyre. However, the closer Alexander and his men got Tyre, the more intense the artillery fire became. The sea floor also took a dramatic, cliff-like drop about half way between the shore and Tyre. The siege weapons had to be covered in wet rawhide so they would not catch fire from the flaming arrows that Tyre shot at them. Despite Alexander’s best efforts to keep his men safe, about 400 were killed in the process of building the causeway, breaking down the city walls and entering the city of Tyre. After seven long months of fighting and blockades, Tyre fell to Alexander’s forces. Of the original population of Tyre, 30,000 were sold into slavery, 2,000 were crucified on the beach and 6,000 were killed during the attack. Alexander did worship Heracles at the temple of Melqart before moving on to subdue Gaza and Egypt. Bose, Partha. “Alexander The Great’s Art of Strategy.” India: Penguin Books, 1 May 2004. Web. The Landmark Arrian: the campaigns of Alexander. New York: Pantheon Books, 2010. Print. This blog is going to focus on Alexander the Great’s use of scouts and the different types. I am going to be looking at two different types of scouts used, the ones to gather intelligence, and the ones who were used in battle. One incident of Alexander’s use of scouts to gather intelligence that I came across the most was for preparing for the battle of Issus. Alexander had scouts go and gather information about the size, status, and location of the fleeing Persians. He also obtained intelligence concerning the terrain of the region so that he could plan and be prepared and have the advantage when the battle actually occurred (Engles 334). Alexander also used scouts in battle. They typically were on horses and were armed. Their job was to be sent ahead of the main army when contact with advance units of a hostile army was expected. The prodromoi were scouts that were equipped with only light armor and a sword. They are defined as skirmisher light cavalry who were equipped for scouting and outpost duties (“Ancient Macedonian Army”). They would jump early into battle and sort of harass the enemy and slash whoever they could. The sarissophoroi were scout raiders who were fast and capable of charging. They had throwing spears but were only lightly armored. The kontos were the scout lancers who were the most heavily armored and were used to break enemy defense lines (“Warfare”). This is a piece of sculpture that forms part of the Alexander Sarcophagus. It represents what a scout in the cavalry may have looked like. He is more heavily armed and has a sword. Alexander benefitted from the use of scouts because it gave him the upper hand in knowing what was going to take place, what the enemy’s plans were, and how to best take his opponent down. This is proven by the battle of Issus, where Alexander was able to develop tactics and strategically place his men to overcome his opponent by using scouts. However, it is written that Alexander’s scouts are not mentioned after the pursuit of Darius, his opponent in the battle of Issus, the theories behind this are that maybe Alexander reorganized the scouts, or that maybe he trained some of the as a unit of javelin-men (Worthington 298). A little while after the battle of Issus, Alexander was planning on marching after Darius a third time, but scouts found out that Darius had been slain before Alexander could get to him, thus the scouts saved him a trip (Rufus 16). A lot of Alexander’s victories can be credited to the use of scouts and intelligence. Without using them, he wouldn’t have gotten the advantage of knowing what the enemies plans were and may not have won so many battles that he did. Rufus, Quintus Curtius and Johann Freinsheim. Quintus Curtius: His History of the Wars of Alexander. 1747. Print. Warfare in Ancient Greece- Cavarly. 28 November 2008. Web. 3 March 2014. Wikipedia contributors. “Ancient Macedonian army.” Wikipedia, The Free Encyclopedia. Wikipedia, The Free Encyclopedia, 4 Mar. 2014. Web. 5 Mar. 2014. Worthington, Ian. Alexander the Great: A Reader. Routledge, 2012. Print. When Alexander the Great reached the Hydaspes River in 326 B.C.E., his conquest of India came to a halt. There he was met by an Indian king named Porus, whose forces kept guard along the opposite riverbank to prevent Alexander from crossing. “The water was high at that time of year…and the current…swift and turbulent” (Arrian, 1958 Trans., p. 268), but Alexander was determined to continue, so he ordered the “continual movement of his own troops to keep Porus guessing” (Arrian, 1958 Trans., p. 267) as to where he would attempt to cross. To add to the confusion, he had his men march around making a lot of noise, which Porus would obviously respond to. But because no crossing ever accompanied the noise and marching, Porus grew complacent and stopped reacting to these movements. Sir Aurel Stein, a British archaeologist, explored the area around the Hydaspes (Jhelum) River in the early 20th century, and did extensive research to try to determine the exact battle site, and how the terrain would have affected it. As it was fought during the “season of rains” (Stein, 1932, p. 37), he concluded that “the waters of the river, swollen by the rains and the melting snows of the mountains, rendered fording impossible” (Stein, 1932, p. 33). The flooded river was a major hindrance to Alexander’s plans, affecting where he could make a crossing, not to mention Porus’ troops were always watching the other side. Despite this, Alexander had a stroke of good fortune when his scouts came upon a crossable location. There was a “projecting spit of land, thickly wooded with different sorts of timber” and not far beyond was “an uninhabited island, also well wooded,” that would provide great cover for his army (Arrian, 1958 Trans., p. 269). Under the cover of a thunderstorm, Alexander finally had the opportunity to sneak across (Arrian, 1958 Trans., p. 271). The terrain of the area had a big impact on where the actual fighting could take place. Due to the heavy rains the night before, “[m]uch of the ground was deep in soft mud, so [Porus] continued his advance till he found a spot where the sandy soil offered a surface sufficiently firm and level for cavalry manoeuvre” (Arrian, 1958 Trans., p. 276). “On reaching a sandy and level position [Porus] halted and drew up his troops in line of battle to await Alexander” (Hamilton, 1956, p. 27). Many historians believe that the battle that ensued, “fought in monsoon rains at the River Hydaspes…was Alexander’s military masterpiece” (Sacks, 1995, p. 17). While the initial battle actions relied heavily on cavalry, the infantry were very much needed. Luckily the battle took place on solid ground rather than mud, otherwise the horses and possibly the elephants would have been rendered useless. Something that set the Macedonian infantry apart was their use of the sarissa, a “13- to 14-foot-long pike” (Sacks, 1995, p. 179). While not as heavily armored as Greek hoplites, “using leather or cloth” armor, as opposed to bronze, their long reach and better maneuverability helped make up for their vulnerability (Sacks, 1995, p. 179). 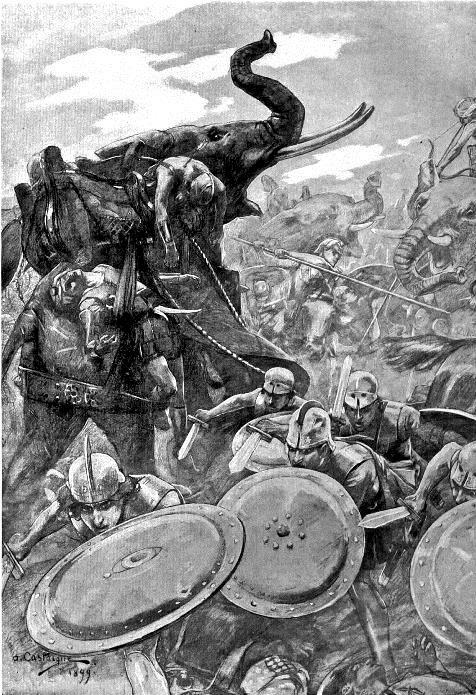 However, Alexander’s infantry had never faced anything like Porus’ war elephants, which “plunged this way and that among the lines of infantry, dealing destruction in the solid mass of the Macedonian phalanx” (Arrian, 1958 Trans., p. 278). The infantry, “though unaccustomed to face elephants and suffering serious losses from their onslaughts, held fast” (Stein, 1932, p. 35). Under Alexander, the phalanx was mostly used to “hold [the] enemy’s charge and damage his formation, while the cavalry looked for a weak point to attack,” as was the case in this battle (Sacks, 1995, p. 179). Toward the end of the battle, Alexander “signaled his infantry to lock shields and move up in a solid mass” to surround the Indian army (Arrian, 1958 Trans., p. 279). This move allowed Alexander to contain and cut down Porus’ remaining forces. As can be seen in the illustration below, the fighting was brutal, and, once surrounded, the Indians didn’t stand a chance against the solid Macedonian phalanx and cavalry (Castaigne (Wikipedia), 1911). The region’s climate and terrain played a huge role in the battle, affecting troop maneuverability, as well as the actual place where the battle could be fought. In the end, Alexander’s army was able to defeat Porus, allowing him to continue his conquest of India. Arrian. (1958). The Campaigns of Alexander (A. De Selincourt, Trans.). New York, NY: Penguin Books. Sacks, D. (1995). Alexander the Great; phalanx. In A Dictionary of the Ancient Greek World (pp. 14-18; pp. 178-179). New York, NY: Oxford University Press. It was agreed that the army travel down south the rivers Hydaspes and Indus so that they might reach the Ocean on the southern edge of the world and from there head westward toward Persia. 1,000 ships were constructed and while the navy sailed the rivers, the army rode down along the rivers banks, stopping to attack and subdue the Indian villages along the way. Alexander III of Macedon, also known as Alexander the Great, was a king of the Greek kingdom of Macedon. Alexander spent most of his ruling years on a military campaign, going through Asia and Africa. He soon, later in his ruling, created one of the largest empires in the ancient world. Alexander was undefeated in battle and is still considered to be one of history’s most successful commanders. Creating the largest empire in the world, leads to the question as to how Alexander the Great accomplished this. In 327, Alexander decided to march on India. He began doing this by getting his army into shape. First Alexander got rid of the baggage train of the Persian loot. He also sent a number of veterans home, while bringing in new fresh troops. He also added Persian Calvary and infantry to his army. Alexander also had great engineers who were able to build strong, large ships. The trireme was the heaviest type of warship used during this time. This heavy ship was propelled by three banks of oars, with one oarsman on each. Far less is known with certainty about the actual construction and appearance of these ships. But many were equipped with cannons that they built. Wanting more, Alexander continued down towards the Ganges River, but many of his men rebelled Alexander took a smaller group on an alternate route which arrived in the Indus Valley upriver from Peshawar. They reached the mouth of Indus, where some problems arose during this route, due to the high mountainous ranges. Alexander the Great used native guides which allowed him to occupy a nearby mountain. His engineers built mound, and soon the fortress was taken. As to how these ships and tactics worked, Alexander had his men build great ships, and this was defiantly needed once they reached India. Also, there was an additional fleet of ships and boats which traveled down the Indus River as well. None of the Greeks had ever encountered anything to prepare them for India. The terrain, the monsoons, and the fierce tribes are some of the problems that they encountered. When the army did move down the Indus River Valley, they did so in a unique way, dividing into three branches. The ships and boats sailed along. Alexander joined this branch. Another branch traveled on the east side of the river, and the third branch on the west side. Of course there was much fighting, as Alexander insisted on destroying any opposition along the way which might be a threat to his future rule of the Indus region. This great ruler was fierce and did not let anything get in his way. Whatever the terrain, from tropical to bitter cold, scorching desert to waterlogged marshland, Alexander met every challenge he was set and overcame every difficulty he encountered. While Alexander’s siege towers breached the most impregnable of strongholds, their bridge-building skills were equally outstanding and allowed them to cross ravines and rivers alike, along with his great ships. Bosworth, A. B. (1996). Alexander and the East: The Tragedy of Triumph. Oxford: Clarendon Press. Naiden, F. (2011). Alexander the Great. Journal of the History of Society, 1, 1-21. Robinson, C. A. (1953). The History of Alexander the Great. Providence, Rhode Island: Indiana University Library. Wood, M. (2007). In the Footsteps of Alexander The Great: A Journey from Greece to Asia. San Diego: University of California Press, 1997.